A. Candidate should be of Indian Nationality. C. Age Limit : The candidates should have completed 19 years of age as on the 1st July of the year of admission i.e. 01.07.2019 There is no upper age limit. D. Educational Qualifications: The candidates who have passed the minimum qualifying examinations mentioned below are eligible to apply. A graduate degree with optional subject Hindi or Bachelor of Oriental Language Hindi or Praveen of Dakshina Bharat Hindi Prachar Sabha or Vidwan of Hindi Prachara Sabha, Hyderabad or any other equivalent recognized qualification in Hindi (BA Standard) by the Government of Andhra Pradesh or MA (Hindi). 1) The candidates who have passed the above examination as on the date of submission of application are eligible to appear for LPCET 2019. 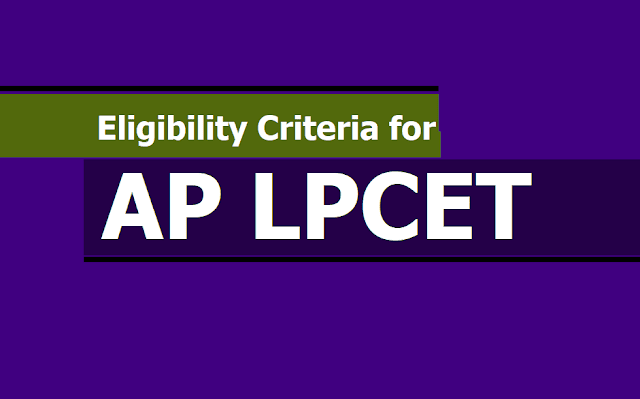 2) The candidates who have appeared for final qualifying examinations or its equivalent during this academic year are also eligible to apply LP CET 2019 Entrance Examination subject to the condition that they should produce their pass certificates at the time of counseling without fail. 3) The above qualifications prescribed are for LPCET-2019 only. The Government may prescribe over and above qualifications at the time of Teacher Recruitment Test (TRT). 4) Qualifying marks in the Entrance Test for general category of candidates shall be 35 percent of the aggregate marks. However there shall be no minimum qualifying marks in respect of candidates belonging to the Scheduled Castes and Scheduled Tribes.